Leaders of industry in North Wales recently came together at Wrexham Glyndwr University to discuss how best to strengthen the economy and create new jobs ahead of Brexit. 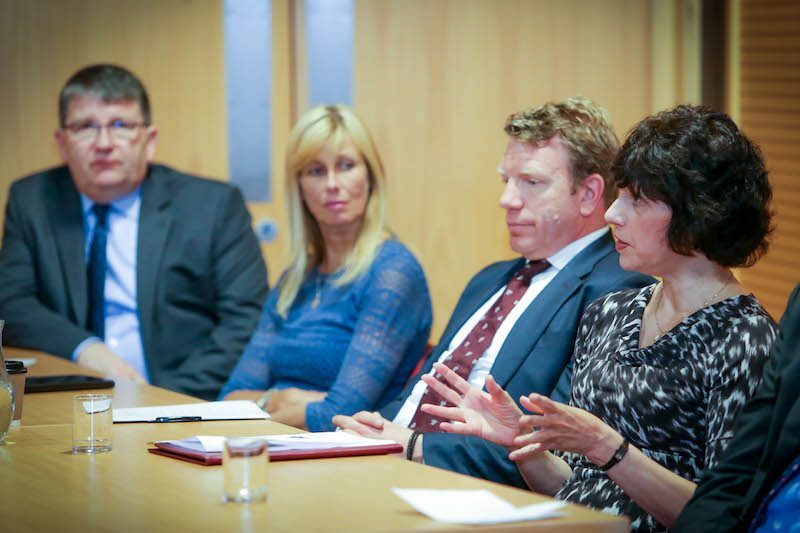 Among the topics discussed by Deeside Business Forum (DBF) were how firms should prepare for the UK’s exit from Europe, pathways to finance, and collaboration between academia and industry. The panel included Wrexham Glyndwr University Vice-Chancellor, Professor Maria Hinfelaar, Comtek CEO and Board member Askar Sheibani and former Chancellor Lord Barry Jones. They were joined at the university’s Catrin Finch Centre by HSBC Commercial’s Head of Economics Mark Berrisford-Smith, who spoke about the upcoming General Election and how Britain should approach a positive deal for industry on leaving the EU. 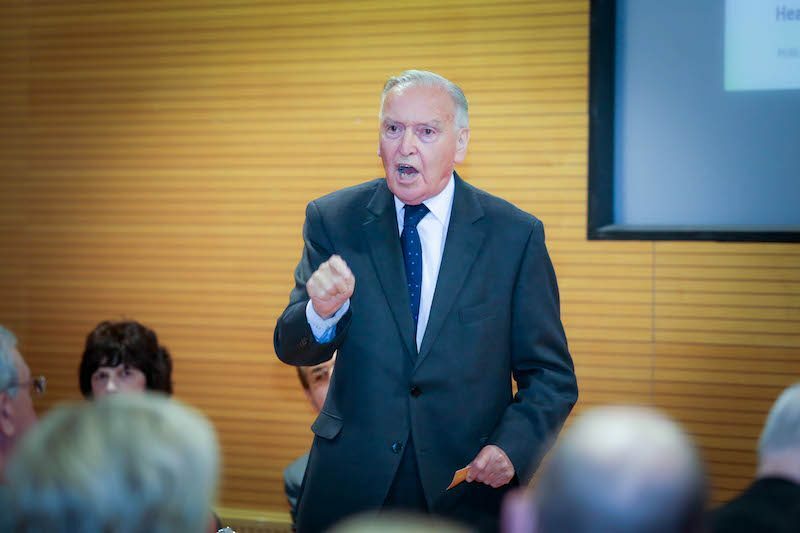 Lord Jones – President of the DBF – showed once again why he is known as ‘Battling Barry’ with a rousing, high-energy speech which called upon those in attendance to help stabilise and build the local economy. “I look around this room and I’m heartened by what I see,” he said. “This is an important time for you, you are the wealth creators, wealth providers – you make work. “So much has gone, so much of our industry, but when I saw you here, so many of you, I could see our area was on the move. Professor Hinfelaar made reference to the UK Government Green Paper on Industrial Strategy, and what it has to say about support for start-ups and international trade. She added that the North Wales Economic Ambition Board’s Growth Vision for the Economy of North Wales called for the region to be better known as a “high quality and excellent location” for new investment, particularly in economic clusters such as advanced manufacturing, energy and digital. “The obvious reality post-Brexit is that new businesses with export potential will require extra backing because of their added value to the economy,” she said. “At Wrexham Glyndwr University we are supporting graduate start-ups and providing new companies with incubation units, teaming up with the Welsh ICE (Innovation Centre for Enterprise) to launch a new base in North Wales, and collaborating to provide coordinated knowledge transfer initiatives benefiting regional business. As part of the conference’s keynote speech, Mr Berrisford-Smith delved into the potential problems Britain could face it is not be able to secure a good deal, including the possibility of defaulting to the World Trade Organisation’s tariffs. Gaynor Dykes, Regional Growth Manager for Grant Thornton and Giles Thorley, Chief Executive for Finance Wales also presented what they offered as companies and highlighted the wealth of financial assistance opportunities for businesses in the area. The conference’s panel was chaired by Neil Ashbridge, a Wrexham Glyndwr University board member and Director of West Cheshire and North Wales Chamber of Commerce. Reflecting on the conference, Askar said: “There was a wealth of expertise in the room, with many organisations coming together to generate ideas that will boost business and provide a strategy in light of Brexit, including the industrial parks and some of the region’s top companies. “For them all to come together at the University is fitting, as it is a driver of the economy and at the heart of industry in north east Wales. Visit the Deeside Business Forum website for further information. More information on Wrexham Glyndwr University can be found here.